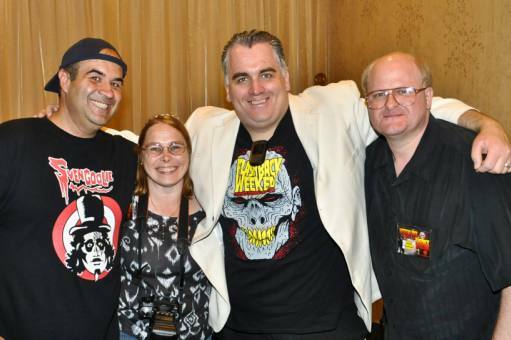 Horror Hosts, Movie Reviews, Convention Coverage and More! 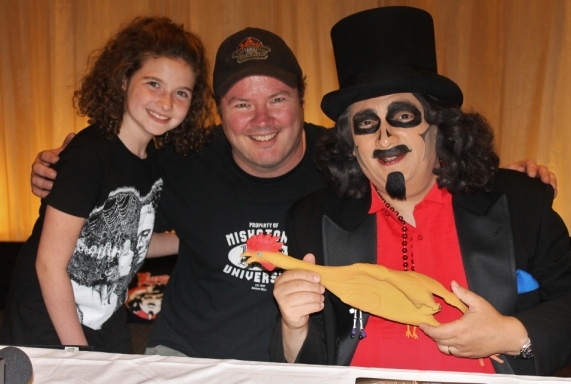 Flashback Weekend: The Rise of Svengoolie! Joined by my friends, Bill and Joan Yingst, we walked around the convention hall of Flashback Weekend commenting on the various dealers and their home-made horror products. In lieu of my recent (and numerous) summer convention visits, I thought I’d pretty much seen everything but Flashback did manage to surprise me none the less. 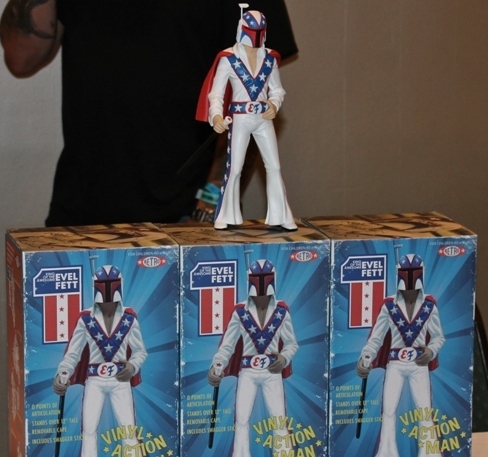 Items such as customized Boba Fett/Evel Kinievel figures are things you definitely don’t see every day…but should at least once in your lifetime! While making our rounds, Joan saw Wisconsin PA host, Dr. Destruction, and asked if I’d introduce her to him. Joan said she found his appearances during my Cincinnati Horrorhound Weekend posts so humorous she just had to meet the man himself so I obliged and took a photo of them. The dual natured Destruction was still in a bit of a funk this day but did perk up for the Yingst’s. After leaving the main hall we ate lunch in the hotel before staging ourselves in the area designated for Svengoolie. At first it seemed to be a strange location (across from the restaurant, down some stairs, and through a door located to the right of an alcove) but when we peeked inside the door you could see that the large room was fitting for the commercial TV host. 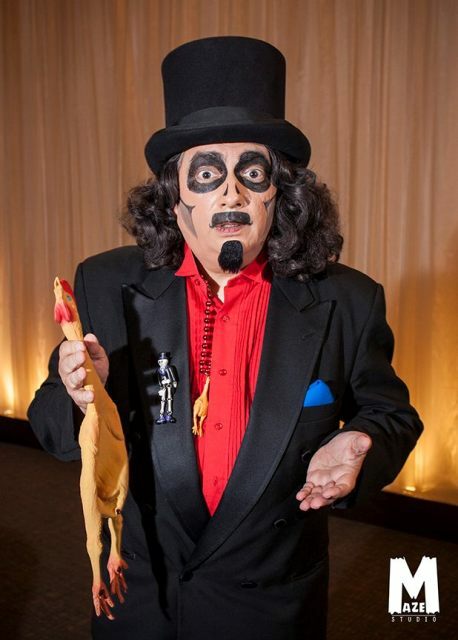 Since going national a couple of years ago, Svengoolie fandom has been spreading like wildfire throughout the country and though he’s always been popular here in Chicago, I’ve noticed he’s bringing in even stronger numbers. That door would remain closed until the signing began (an hour later) so we were content to sit and wait on the stairs as the line began growing behind us. Even before hitting the national stage, Svengoolie commanded a huge turn-out at Flashback so we didn’t mind the wait and, let’s face it, sitting is infinitely better than standing. 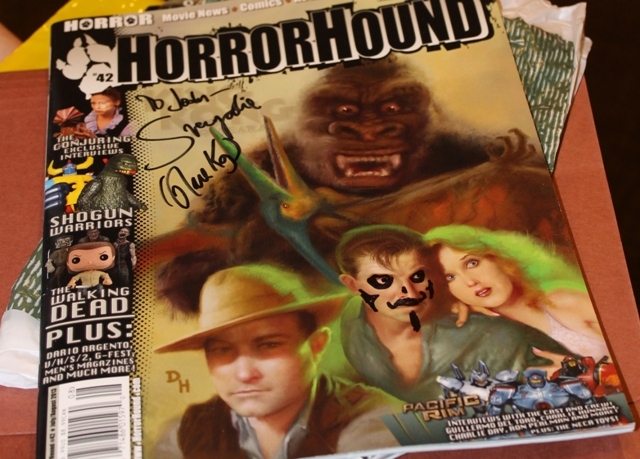 Joan brought along her copy of the latest issue of Horrorhound Magazine for signing. 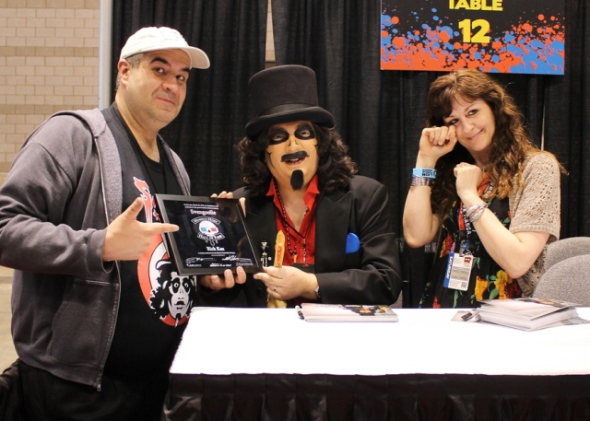 It had a short article I wrote about Svengoolie inside along with a picture featuring her and I with the man himself. The shot was taken at C2E2 last March (see story HERE) and is a prime example of me being a bit of a smart-alec. I’ve already discussed my feelings concerning the last “Horror Host Hall of Fame” (seen HERE) and how embarrassed I was that Sven was even a part of it. What I didn’t mention was that, after the ceremony, Jason Hignite asked me to take a picture of Svengoolie receiving his “award” so it could go into Horrorhound Magazine. Since NO publicity is bad publicity, I wanted to see Svengoolie get into the magazine no matter what the circumstances. I should mention that Sven has never said anything negative to me about the “Hall of Fame” (though after winning eight local Emmy’s it’s hard to imagine him being too terribly thrilled either) and that my opinion regarding that matter should not reflect his. Also, it was the help of Horrorhound writer, Aaron Christensen that made it a reality. But, yeah, my having Joan “fake cry” as if it were an Academy Award was evidence of both me being obnoxious as well as Joan being a great sport. While discussing our diabolical plans, a man sporting a Mickey Mouse hat came by and shook my hand. I’d seen him before at the aforementioned C2E2 but it was a bit of a whirlwind. Amid the choas of fanboys and cosplay he brushed past me saying, “Hi Dave! You don’t know me, but I love your Svengoolie blogs!” before disappearing into the crowd. Today wouldn’t be much different as he said hello, shook my hand, and (while I was in the process of standing up) disappeared yet again. At least this time I had an idea he was associated with Flashback somehow. I also hoped he was planning on walking over to Wizard Con across the street with that hat of his. Since Disney now owns Marvel as well as STAR WARS it would have been a good bet half the convention would have bowed before him as soon as he walked in. Since I was now on my feet I thought I’d go survey the line which was now wrapping its way down a long hallway. I saw my fellow Goolies, Don and Bunny Urban , waiting within and said “hello.” It wasn’t long after this that Svengoolie walked past us and the signing began. 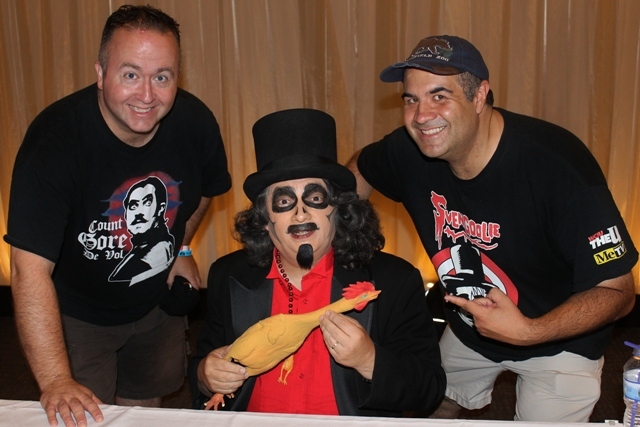 For the past year, I’ve developed a sort of unspoken rapport with the Svengoolie camp. 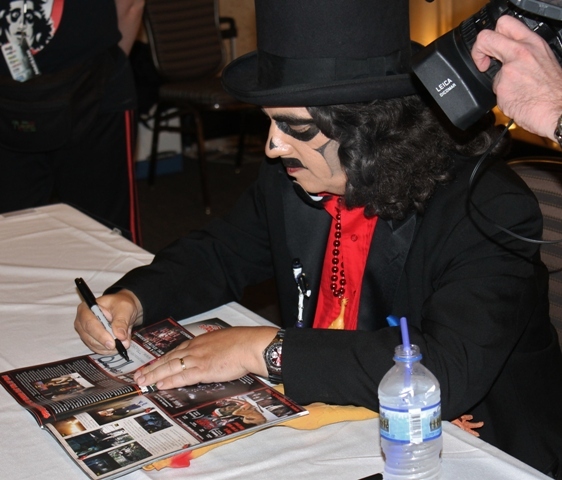 I don’t take up any time away from fans waiting to see him, and they allow me to hover nearby the entire signing so I can catch any interesting fans or Svengoolie related items for this blog. If I’m lucky I get a few words with him after it’s all over but these days, with him often having to stay later to accommodate everyone, I’m getting less and less fortunate. As soon as the doors opened I left the line and headed off to the side of Svengoolie’s table. Jamie Lee Cortese was with the crew as she’ was working as an intern (which meant no femgoolie costume for her) and its always nice to see her. I said hello to his assistant, Jim Roche, and the show’s director/camera man, Chris Faulkner too, before showing them my Svengoolie shirt and relaying the story of Gene Simmons adding a KISS bat-wing over one of Sven’s eyes (story HERE). The line started moving but seemed to have no end in sight. Joan and Bill were first to see Sven. After saying hello to Sven, Joan showed me her magazine which he not only signed but added some original Svengoolie artwork to as well. 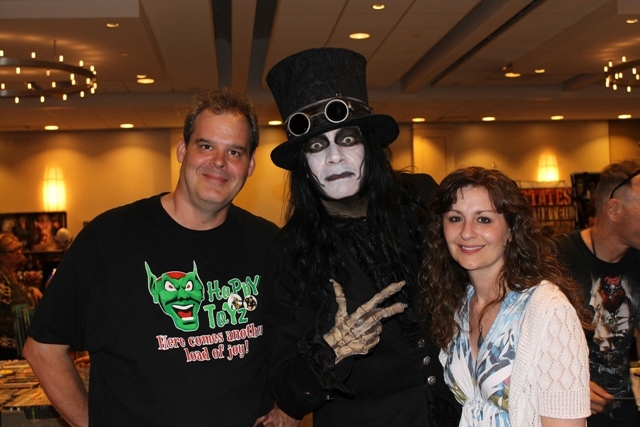 At this point the Yingst’s decided to go check out Wizard Con (there were a lot of folks taking advantage of both events) agreeing to join me for the Flashback costume contest with Svengoolie later on (and to be covered in my next Flashback chapter). My buddy, Russ Wrangler, was there with his daughter (and fellow monster fan) Mya and it was great seeing him again. Ironically the last time we’d seen each other was that fateful day with Gene Simmons. Russ and his beautiful daughter, Mya! 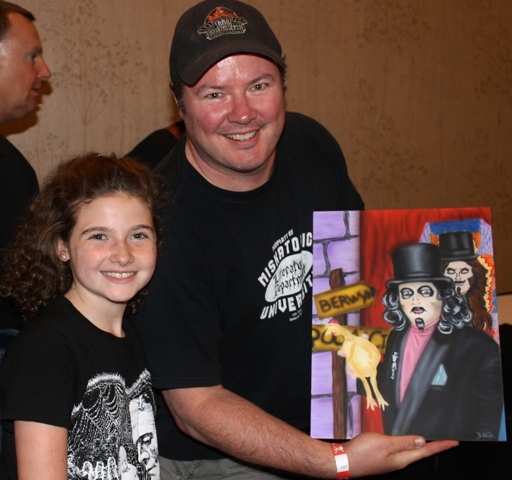 He finally got to meet Svengoolie for the first time and gave him a painting he’d made for Svengoolie’s Scary Monsters Magazine tribute issue. We talked for a while before he took off to enjoy the rest of the convention with Mya, and I was soon joined by Don and Bunny who finally introduced me to the mysterious man in the Mickey Mouse hat. I swear, Bunny knows EVERYONE! His name is Don Johnston and he’s a big fan of Svengoolie, friend of Flashback, and works at the hotel. This time we were able to keep him still long enough for photos. This was definitely an appearance for first time Sven greeters. I saw my friend, The Pumpkinman (Indiana PA host) in his signature costume. 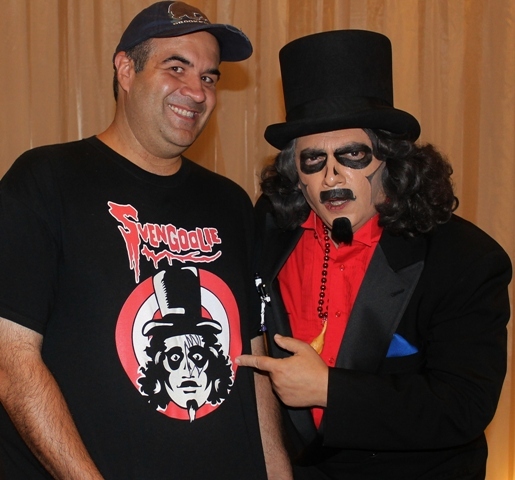 He told me that he’d never met Svengoolie before and was extremely nervous. I told him he had nothing to worry about which is something he soon discovered for himself. He’d soon find that this would be his lucky day in more ways than one but that’s for the next chapter! After over an hour the line seemed to have no end and I knew it was soon going to be “cut” so Sven could get to the costume contest on time. I frantically texted Brian Maze that he best hurry up and get over here before missing his chance to meet the host. Brian was over at Wizard Con and quickly made his way back to Flashback. He was wearing a Count Gore de Vol shirt but quickly purchased a Svengoolie one while waiting in line. Brian would later take some great pictures of Svengoolie (one shown at the top of this piece) and later told me how great he thought the host was (which I already knew as should everyone who reads this blog but I suppose seeing is believing). Svengoolie took off with his crew out into the convention’s main hall to film bits for his show. Now joined by the Urbans, we decided to make our way towards the costume contest while they updated me on some of the panels they’d attended at Flashback (and will hopefully share for everyone here). At least we could see what cosplay Flashback had to offer all in one spot! 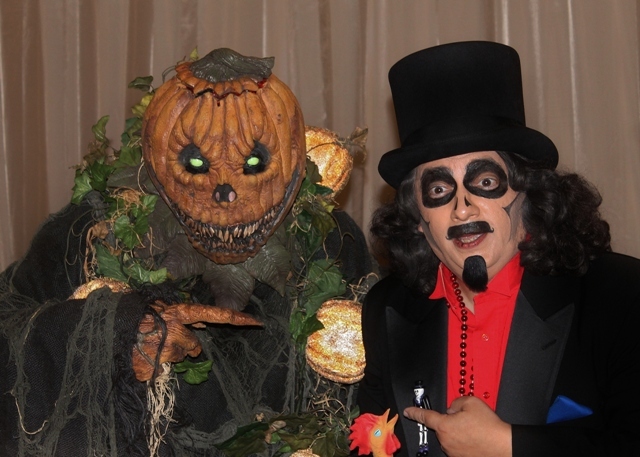 This entry was posted in Convention & Expos, Stalking Svengoolie! 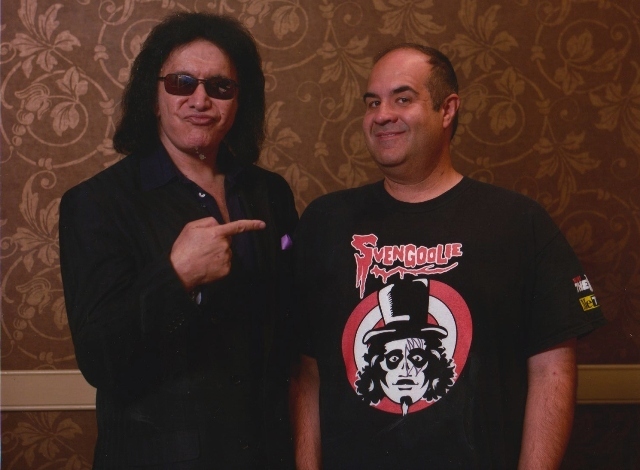 and tagged Flashback Weekend, GENE SIMMONS, Svengoolie. Bookmark the permalink. ← It’s Clear…THE FOG Blu Ray is a WINNER! Search The Website If You Dare! Cemeteries & Famous Grave Sites! Terror Daves on the Road!